Their e-vite went out a little over a month ago. It was sent to more than 50 people. About half responded yes, a few responded maybe (Really E-vite? Maybe? Do you see “maybe” on a wedding invitation? ), the rest didn’t respond at all. It’s really puzzling to me as to what kind of society have we become where we can’t take a few moments out of our “busy” lives to respond to a simple invitation. RSVP or répondez s’il vous plait means to “reply please” or “please respond”. Friends and family take the time to open their doors and have celebrations. These kinds of events take lots of planning, time and money. Most people these days do not have the courtesy of taking the time to send a simple response. 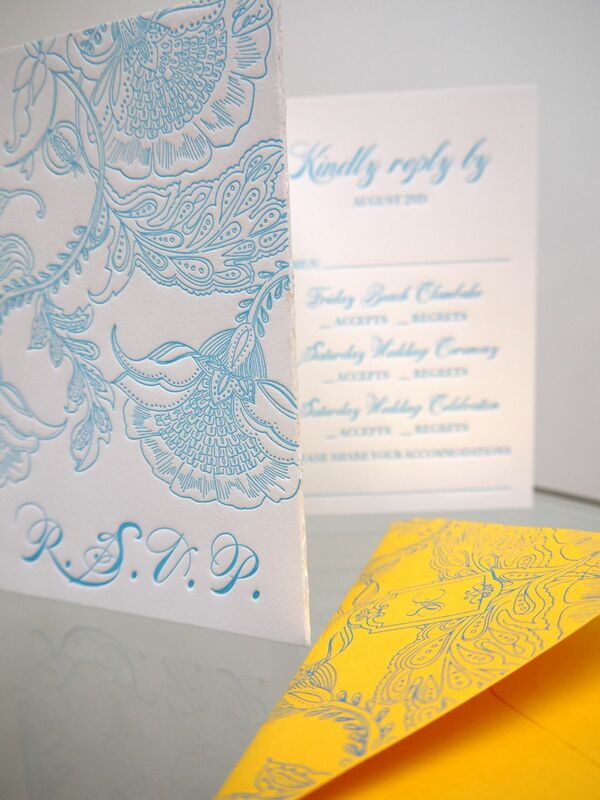 A beautiful RSVP card from our friend Ceci New York. At my friends BBQ, half of the people who did respond yes to the e-vite did not even show up. There was no telephone call, email or text message to say that they wouldn’t be able to make it. I understand that things in life happen and we have to break our plans, but the least we can do is let our host know that we won’t be able to make the party. No excuse is needed, and your host won’t waste food and can make the proper accommodations if it’s a sit down dinner. Of course my friends were disappointed that their guests could not make the party, but they were even more disappointed that no courtesy was given to them to let them know that they would not be able to attend. Being in the wedding industry has made me hyper aware of this situation. When we work with our hotels, I am often waiting for the guest counts to come in from their clients so I can tell my chef how many servings a cake needs to be. I hear all kinds of stories from our party planner friends that they are calling guest lists on the phone on behalf of the bride because more than half of the RSVPs have not been received. (In a wedding invite they are already pre-stamped, the work is done for you, all you have to do is check a little box!) When ever I receive an invite: whether it’s an e-vite to a work or social event or a paper invitation I have received in the mail, I take that moment to respond. After all, this person went out of their way to invite me to something special, the least I could do is give them the courtesy of a response. Whether it is yes or no, it’s polite and it’s the right thing to do. Nicely put…….we had four couples respond to our wedding invitations confirming their attendance and didn’t show up and never even mentioned it when we saw them afterwards! I totally agree with you on this subject. Thank you for mentioning it too. I have been responsible for planning some very large events and it’s always the one pet-peve that I have when people don’t rsvp. It’s true that money, time, and quantity of food hangs in the balance and can cause problems. Let’s all agree to return to good manners and do what is right, right? My nephew invited 30 people to his son’s christening. Only 3 responded and he had to call the rest himself so he could give the a final head count to the restaurant he where was having the party (fortunately it was a friend so he could wait til the last minute!) I believe it is extremely rude and inconsiderate to not respond to an invitation of any kind, formal or informal. In this age of electronic invitations like evites it should be that much easier to respond! Just amazes me! I totally agree with you!!! I just had my daughter’s poolparty….a simple poolparty, out of the 25 kids invited, two parents replied as to not being able to come. The rest of the 10 kids were MIA……left with 10 “take-home’ goody bags. So had to throw them away….money down the drain! YES! This is a HUGE pet peeve. This may be tacky, but don’t put the location of the event in the invitation. My son’s classmate had a b-day party. His mom forgot to put the location on the flyer she passed out at school, but of course had an RSVP and a number. I called to say we were coming, asked about the location, and that is when she realized it wasn’t on there. Yes, we did attend. Now, I think it is a clever idea especially for all these little pre-school parties we have been attending lately. I had over 25 goody bags left after my son’s birthday party. Waste. I blame the lack of RSVPs on why Americans have turned to the tacky “byob” party. I mean seriously who can blame them?? You’re buying, prepping, cooking, setting for a certain number of people…..oh wait you don’t have a certain number because Rude Ruderson has yet to RSVP…..so you’re next party becomes Byob and bowls of cheetos and plastic containers of ranch dip are your table centerpiece!! I beg Americans to RSVP and stop the byob insanity!